Smagghe & Cross - Untitled. Vinyl LP. Bleep. Vladimir Ivkovic continues to plough his own unique and uncompromising path with this latest release on his Offen imprint. 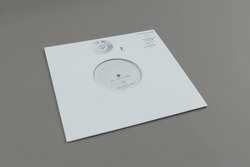 This special 10 inch from the duo of Smagghe & Cross comes soon after their debut LP, also released courtesy of Offen. Both sides contain tracks which feel as if they’ve been plucked straight out of one of Vladimir’s highly revered DJ mixes, managing to transcend time or place and carry with them an air of refined and considered production. These aren’t throwback industrial jams, nor are they a direct copycat of what has come before. They manage to push the envelope out whilst demonstrating firm appreciation of their context.